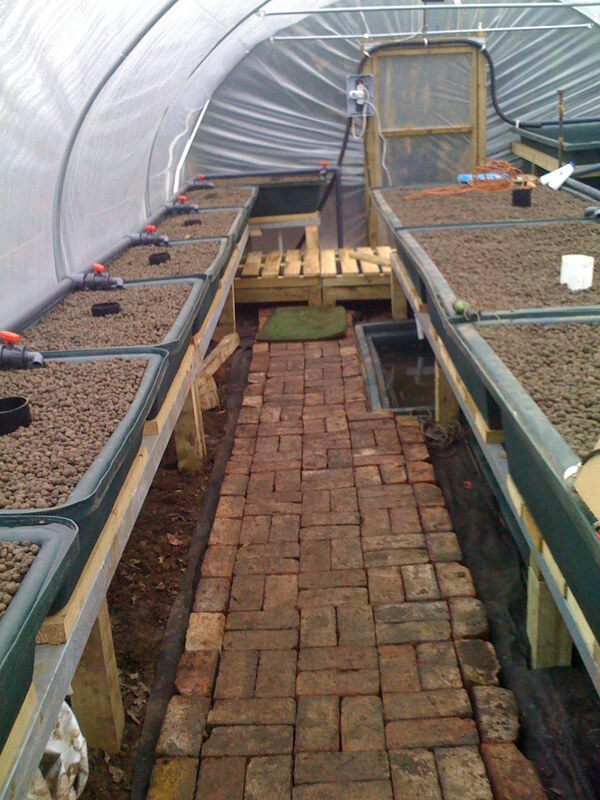 You can see my beautiful brick path – good thermal mass to help with moderating the polytunnel temperatures, and much nicer to walk on than the mud! The large buried sump at the back has a timber deck covering it that the kids can stand on to reach the back beds – so I think those will now be their spot for planting. The timber “paving” is over the new link between the two shallow sumps – designed so that I can lift it up to check for leaks. Now it’s all “cycling” again – building up the bacteria that’ll clean the water. 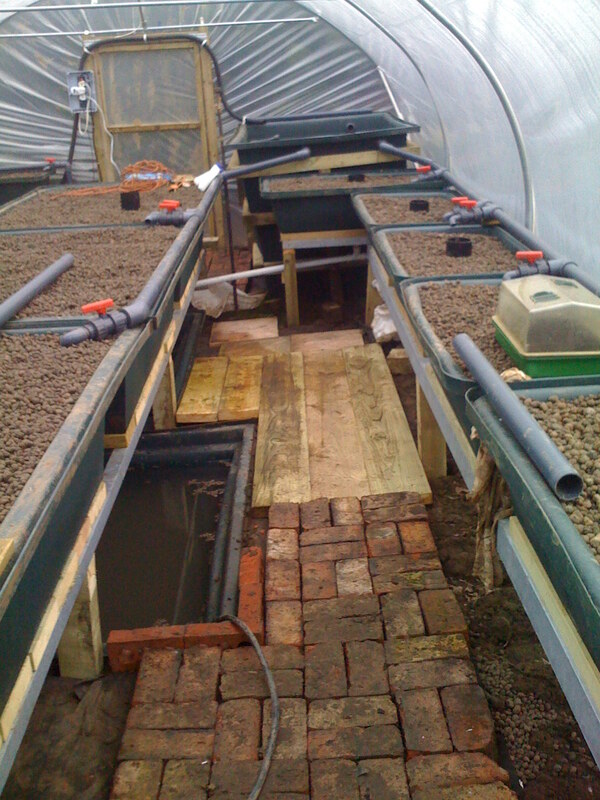 Soon I’ll start planting – but in the meantime we have our first Aquaponics workshop on next week, so time to tidy up! Sorry I haven’t been posting much recently – been too busy with aquaponics / filling gaps in house walls & other draftproofing / aquaponics / Transition Town Altrincham, Hale & Bowdon / being on BBC Radio Manchester / changing lightbulbs / saving 1.5 kWh per day by buying a new freezer / aquaponics / and some Christmas and New Year stuff too! This is the ice on the top of the fishtank. To give you an idea of scale, the thickest bits are 2-3 inches thick. 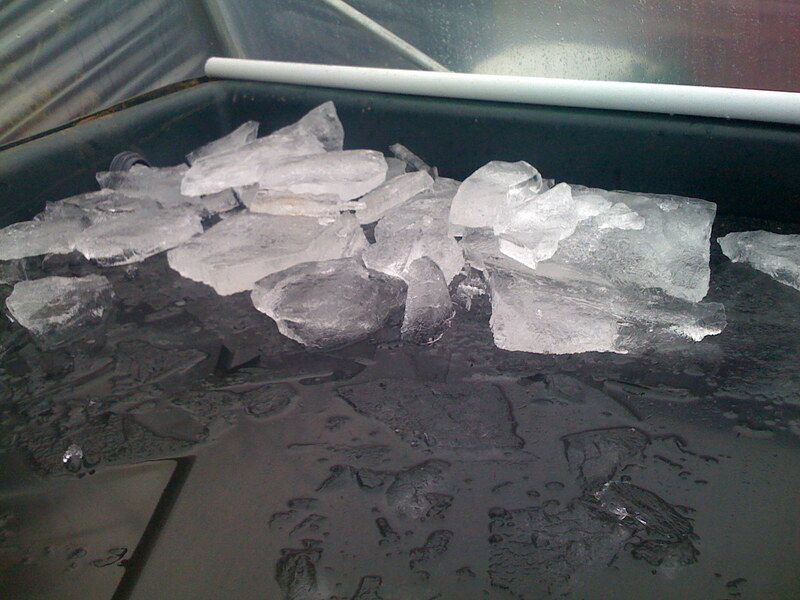 The water temp is down to 2-3°c and the polytunnel itself got down to -4.5°c at its coldest.